Aberdeen’s burgeoning student population is set to receive more accommodation options once the prestigious Triple Kirks scheme completes in late 2019. 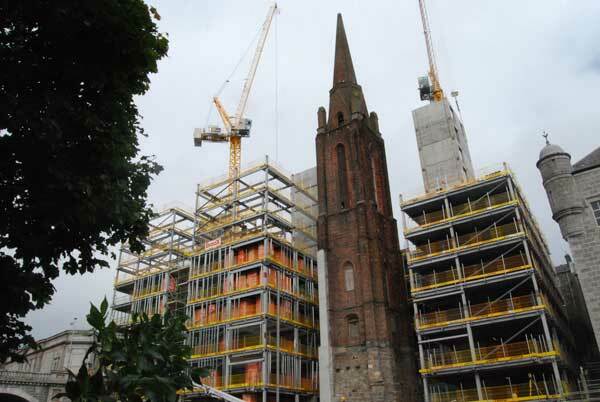 Being developed by Dandara, the project comprises three interlinked steel-framed blocks (11, 12 and 13-storeys high), offering 337 en-suite accommodation units and ancillary facilities, that occupy a constrained site with a Grade A listed church spire dating from the 1840s. Alongside the construction programme, restoration and refurbishment work is also being undertaken to the spire so that it will become a feature element within the completed development. Fabricated, supplied and erected by EvadX, the steel frame totals 600t with an extremely high piece count. This is because there are no long spans and the grid pattern is very irregular as it has to encompass three different room sizes, all of which are present on each floor. Typically, the design has a central corridor with accommodation units situated either side. Blocks one and two sit to the north of the spire and block three is positioned to the south. Two and three are linked via a narrow corridor structure that wraps behind the spire.